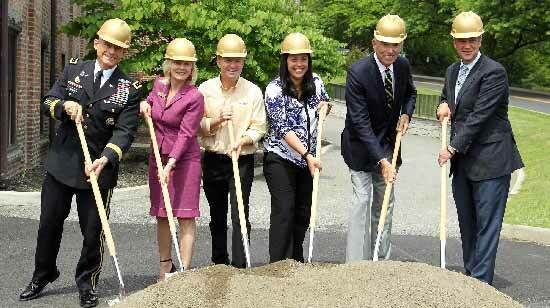 WEST POINT, N.Y. – Army West Point Director of Athletics Boo Corrigan has announced that construction is set to begin on the Anderson Athletic Center, which will be the new state-of-the-art home for the Black Knights' sprint football, softball and volleyball teams. "We have an incredible opportunity to offer top-level support for many of our cadet-athletes thanks to the Anderson Athletic Center," said Corrigan. "Lee and Penny Anderson have been transformational for the Academy and the Athletic Department. Not only have the Anderson's been instrumental in developing our men's and women's rugby programs, but have endowed head coaching positions and contributed their time and mentorship. The building timeline would not have been met without the significant support of Bill Sandbrook, John and Ellen Drew, and Bill and Diane Spurgeon and the Class of 1981." Located between Shea Stadium and the Softball Complex, the Anderson Athletic Center was originally built in the mid-19th century as a boathouse, but the renovation of the building will now create a multi-purpose athletic facility to enhance the cadet-athlete experience across multiple sports. These teams and others who will train there encompass about 40% of those at the Academy competing at the intercollegiate level. The first floor of the building will be a 6,630-square foot strength and conditioning training center which will be utilized by sprint football, softball, men's and women's rugby, men's and women's track and field and cross country, as well as volleyball. On the second floor, state-of-the-art locker rooms will be built for the sprint football, softball and volleyball squads. A 500 plus-square foot self-serve nutrition center will also be installed to properly fuel cadet-athletes to maximize the value of their workouts. "John Drew has been an absolute driving force in ensuring our cadet-athletes have what they need to win," said sprint football head coach Mark West. "Whenever the team needs support, John is the first one in line asking what he can do to help. His remarkable contribution to the new Anderson Athletic Center will have a lasting impact on the sprint football program for generations to come." The sports performance coaches shared in West's sentiments that the facility will provide a great experience for the cadet-athletes. "The sports performance staff is very grateful for the generosity of our donors, and especially to Bill and Diane Spurgeon and the Class of 1981," said Director of Strength and Conditioning Scott Swanson. "This will be a premier Sports Performance Training and Nutrition Center to allow our cadets the very best opportunity to excel. Building this in close proximity to each program's athletic fields and courts will allow everyone to get into the weight room more frequently, train harder, and provides the cadets with optimal performance fueling to see greater results." For more news and information about Army Athletics, please follow @GoArmyWestPoint on Twitter and Instagram.